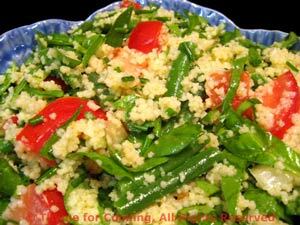 Spinach, Green Bean, Couscous Salad, seasonal sides, Thyme for Cooking. Top and tail beans, cut into bite-size pieces. Shred spinach: put the spinach leaves together in one hand and snip with a scissors. Add vegetables and herbs to couscous and fluff with a fork.